Once you exclude your brand terms – plot the traffic graph for your non-brand terms. It’s relatively easy for ecommerce websites to calculate this once you have the tracking in place; however, the tricky part is for non-ecommerce websites to estimate ROI on SEO. This is where tracking conversions and setting goals becomes crucial – a conversion might be a sign-up, email opt-in, of just pageviews which drive up your advertising revenue. Once you’ve identified your conversions and set this up the next step is to attribute a revenue number with each conversion. Let’s say you make $5 RPC (revenue per conversion) – so if you drive 50,000 incremental visits at an average conversion rate of 5% and a RPC of $5 – your revenue generated is 50,000 x 5% x $5 = $12,500. Now that you have the revenue number you can calculate your SEO ROI. SEO helps in increasing the incremental visits as you continuously invest in content and link development strategies. Another lever that you can pull to maximize revenue is the conversion rate on your website. Visual Website Optimizer is a great tool that can help you A/B test landing pages to improve overall conversion rate. 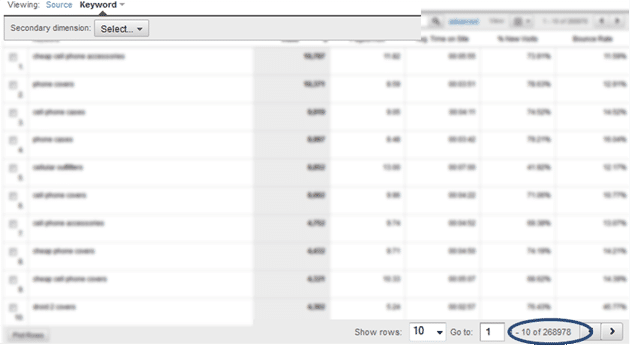 1) Number of Keywords driving traffic: This is a great metric to track your overall on-page optimization efforts. This tells you the number of keywords driving traffic to your site. 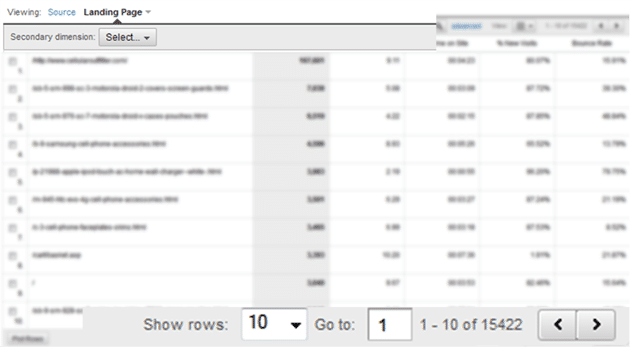 In Google analytics go to Traffic Sources -> Search Engines -> “non-paid” -> under source chooses “keywords”. 2) Number of Landing Pages: Another great metric to track, this tells you the number of unique landing pages that are driving traffic to your site. As your SEO traffic start to grow you should start to see this number increase. Search Engine Optimization has evolved in to being a highly effective marketing channel – and its exciting to be able to track this very closely!